Austrian investigators have raided the home of the leader of a far-right group in connection with the investigation into the New Zealand mosque attacks. Martin Sellner, of the Identitarian Movement Austria (IBÖ), said in a video he had received a donation, possibly from the chief suspect in the Christchurch shootings. But he denied any involvement in the attacks. Fifty people died and dozens more wounded in the 15 March shootings. Australian Brenton Tarrant, a 28-year-old self-proclaimed white supremacist, has been charged with one murder and is expected to face further charges. In a video posted online on Monday, Mr Sellner said he had received an email containing a "disproportionally large" donation from a person named "Tarrant". He said he had sent a "thank you" reply as he did with other donations. "I have nothing to do with this terror attack," Mr Sellner said, adding that his organisation was a peaceful anti-immigration group. He said investigators raided his flat in Vienna on Monday and seized his phone, computer and other devices. Interior ministry spokesman Christoph Pölzl said the search had been carried out by anti-terrorism officers on the orders of the prosecutor's office in the city of Graz, which is investigating the case. A spokesman for the prosecutor's office said they had noticed the suspicious email address while investigating a donation of about €1,500 (£1,290; $1,700) to the IBÖ. Austrian authorities confirmed last week that Brenton Tarrant had visited the country, possibly last November, although details of his stay there are unknown. 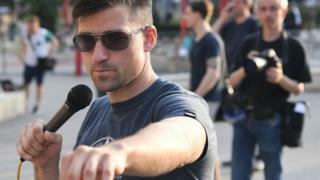 Mr Sellner has become one of the most prominent young activists of the far right in Europe. In March last year he and his girlfriend Brittany Pettibone - an alt-right vlogger and conspiracy theorist - were refused entry to the UK. The authorities said their presence in the UK would not have been "conducive to the public good".